I'm pleased to note that all Blue Box podcast episodes are now available again. As I mentioned yesterday, it was purely an administrative issue with the payment method. For those curious, this show is a prime example of the "Long Tail" of content on the Web - even though we haven't produced a new "real" show since #85 on October 23, 2008, we still see anywhere from 30-100 downloads of various Blue Box shows every day. People are finding the show through various search terms and listening to the episodes. Perhaps somewhat sadly this is also a commentary on how relevant some of the same VoIP security issues we discussed from 2005-2008 still are today in 2012! My apologies, again, to anyone who tried listening over the past weekend when the show was offline. Thank you for the interest and for I hope that you find our past episodes educational and useful. Dan York, CISSP, is the Chair of the VOIP Security Alliance (VOIPSA) and Senior Content Strategist for the Internet Society. Jonathan Zar is affiliated with Pingalo and is the Secretary of VOIPSA and member of the Board of Directors. This is a personal project and neither the Internet Society, Pingalo nor VOIPSA have any formal connection to this podcast. In the interest of transparency we just thought you should know our affiliations. We chose the name "Blue Box" primarily as a nod to the era of phone phreaking in part to illustrate that threats to telephony are not new - they just continue to change and evolve. That and admittedly the name just sounded cool. Add this graphic to your site! 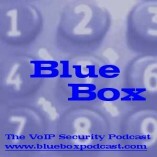 Raffi on Welcome to Blue Box: The VoIP Security Podcast! Dan York on Blue Box podcast #70 successfully recorded... on *conference WiFi*! David Corking on Blue Box podcast #70 successfully recorded... on *conference WiFi*!